Sept. 28, 2015 | LITTLE ROCK – Get ready for a frighteningly good time this Halloween at the Tiny Hands Monster Bash. The costume party fundraiser is scheduled for 7-11 p.m. Oct. 30 at Next Level Events, located at 1400 W. Markham St. in Little Rock’s Union Station. Tickets are $60 in advance or $65 at the door. 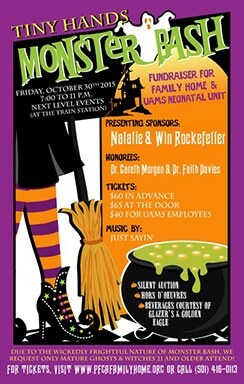 Purchase tickets online at www.pfcafamilyhome.org or by calling (501) 416-0113. Guests must be 21 and older and are encouraged to come in costume, although it is not required. The evening’s entertainment will include live music by Just Sayin’, a silent auction, hors d’oeuvres, and beverages courtesy of Glazer’s and Golden Eagle. A cash bar will be available. Honorees are Gareth Morgan, M.D., director of the Myeloma Institute at the University of Arkansas for Medical Sciences (UAMS), and Faith Davies, M.D., deputy director of the UAMS Myeloma Institute. Davies also serves as director of developmental therapeutics and director of phase 1 clinical trials. Proceeds from the event benefit the Family Home and the UAMS neonatal intensive care unit. Presenting sponsors are Natalie and Win Rockefeller. The Family Home is a private, nonprofit facility that offers comfortable and affordable housing to patients receiving outpatient treatment at the UAMS Winthrop P. Rockefeller Cancer Institute and to parents of premature infants being cared for at the UAMS Medical Center.